Blastrac recently carried out a project within a former drilling rig, using its 500E horizontal steel blaster, in combination with a BDC-99 dust collector. This old platform is being refurbished in order to transform it into a storage platform where generators will be stocked. Its goal will be to supply energy to a few drilling rigs located nearby. 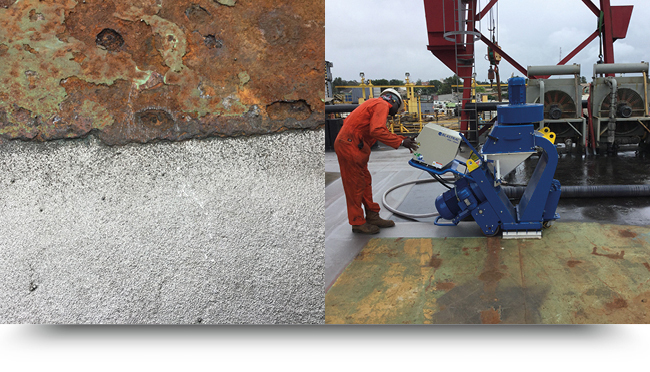 The main objective was to remove the old coating from the steel surface before applying new paint & coatings. Despite the large amount of rust on the surface, the machine easily achieved a SA 2,5 profile. It means all oil, grease, dirt, rust, paint or other foreign matters have been completely removed from the surface by abrasive blasting. Below you can see a picture showing the difference between the original surface & the blasted surface. The blasting process is environmentally and operator friendly. There is no dust exposure, it is a recyclable process and there is no use of chemicals or drinking water.